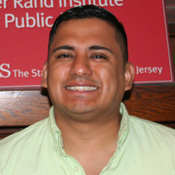 Dennis Pelaez-Robles graduated from Rowan University with a bachelor’s degree in mathematics. Currently, he is leading the research and evaluation of the Cumberland County Collaboratives as part of the South Jersey Strengthening Families Initiative funded by the Pascale Sykes Foundation. Mr. Pelaez-Robles plans to pursue a Master’s of Business Administration. This page was printed from http://rand.camden.rutgers.edu/dennis-pelaez-robles/ at 8:36 PM Saturday, April 20, 2019.